I've been at it again! I got to do a little thrifting this morning and it was such fun. I try not to go so often these days because I always find too many things I "NEED". LOL! I have learned to be more choosy and not bring so much home. I had a 20% off coupon for this thrift store so I got even better deals. Let me show you what I got. 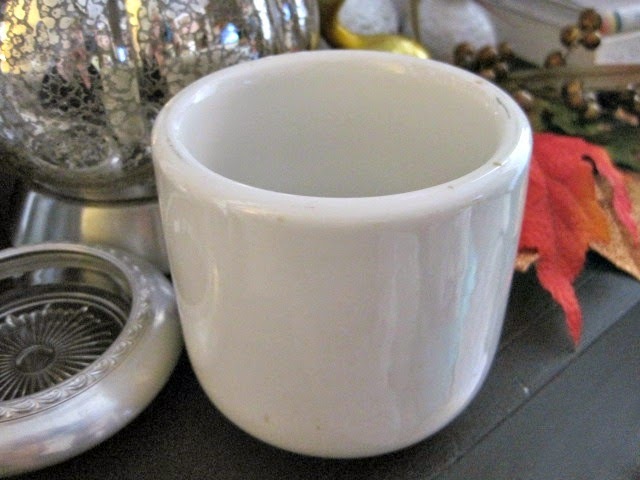 I love this small ironstone bowl/cup. Not actually too sure what it is, but it was super heavy and priced right at $0.99. I paid $0.80 with my discount. 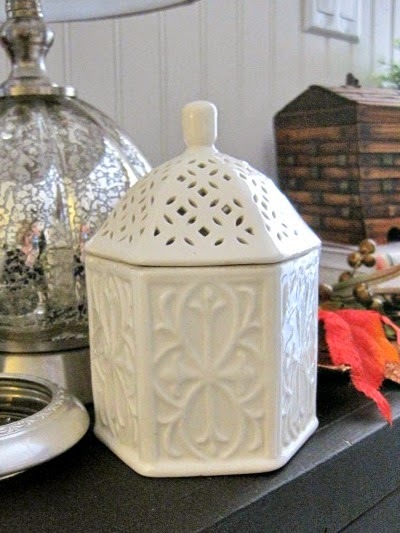 I thought this container was so pretty with the cutwork design in the lid. I got it for $1.80. 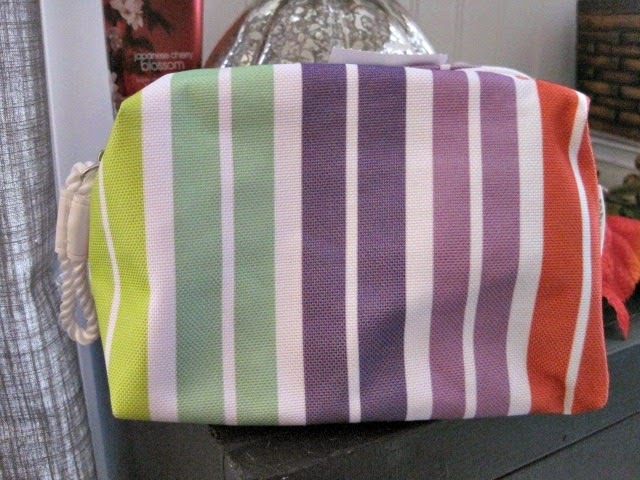 A brand new, large makeup bag for around $0.60 had to come home with me. This is something I actually needed. 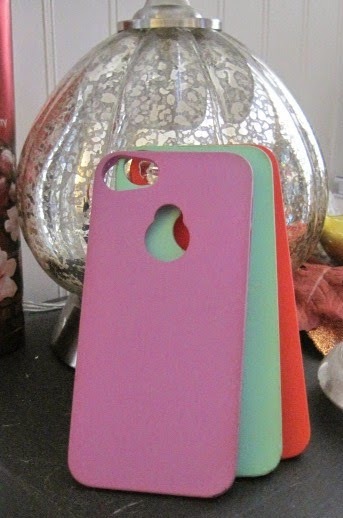 As were these iPhone 5 cases. I recently upgraded and had not bought a case yet. I got three cases for $0.08 each, yep, $0.26 total! That was a steal...:) I don't like big bulky cases , so these were perfect for me. 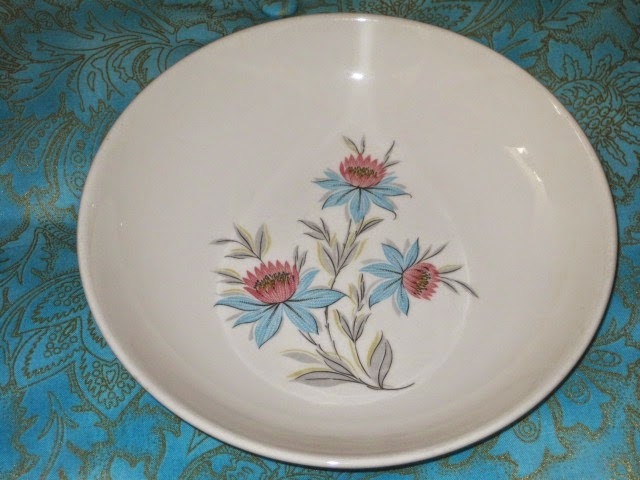 These gorgeous, vintage bowls by Steubenville hopped right in my card. They will be so pretty in a tablescape.....if I ever get my table built! I found a set of 4 on Etsy for $35.00. I paid $1.60 for my 4! 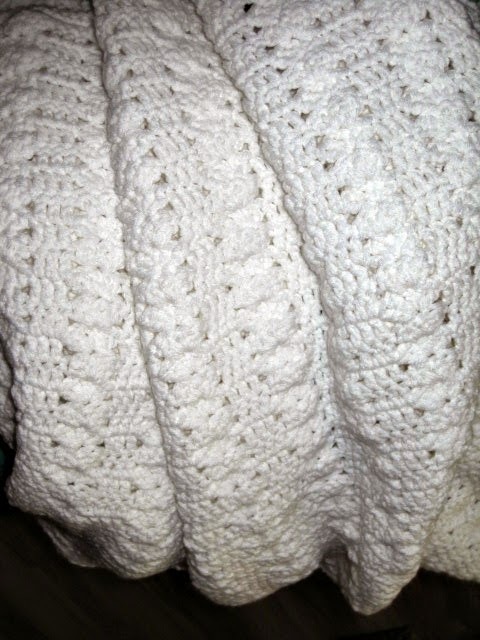 This beautiful white afghan had to come home with me. It is not stained anywhere and a nice size. I got it for $1.60. 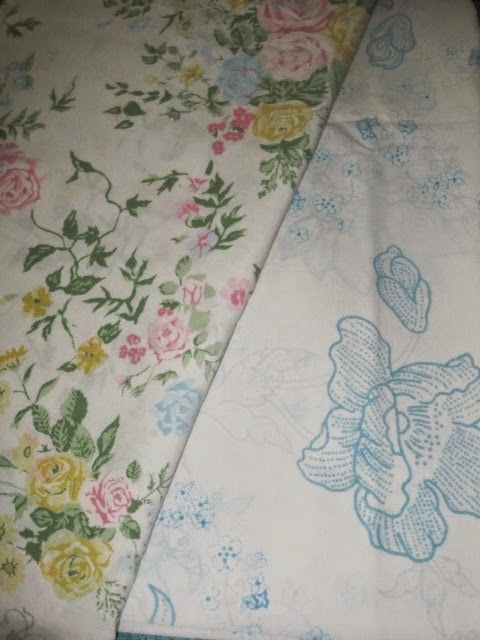 Two more vintage pillowcases to add to my collection. I think they were $0.40 each. I picked up a couple things for other people too. 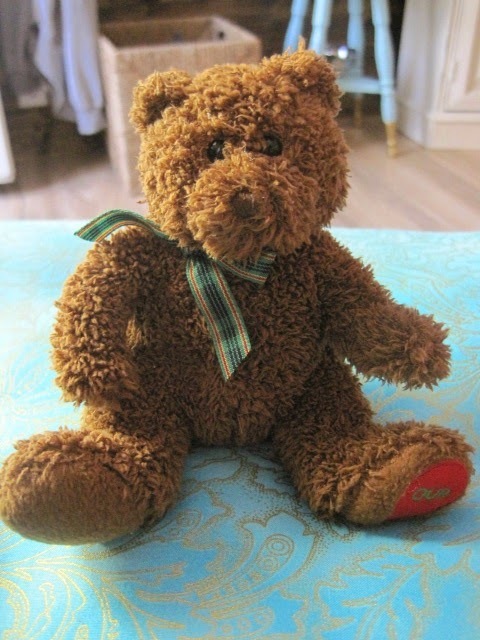 My librarian friend at school is decorating a huge Christmas tree in the library this year with brown teddy bears. This little cutie will be perfect. He is a Ty and was $0.25 I think. 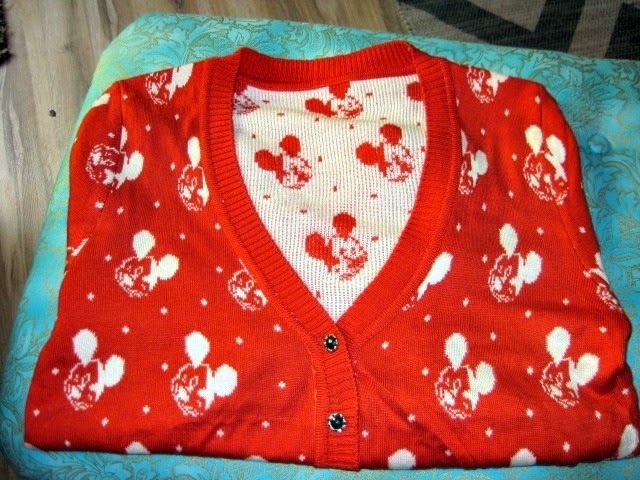 My friend Heather is a Mickey Mouse lover and so I couldn't pass up this adorable cardigan for her. It is like new and will be so cute on her with jeans and a pair of boots. It looks red but it's actually a pretty shade of orange. Clothes were 50% off today so this was just $1.50. And this is what she painted! Isn't it just precious? I am so in love with it. She painted it in the colors I love most...blues, greens, and a pretty coral orange color. It could not be more perfect! Anywho, I have already proudly displayed Saide's portrait on my gallery wall. See it there above my couch. It adds a nice pop of color I think. That new throw on the couch is a new purchase from today. I love the Better Homes & Gardens brand that Wal Mart carries. 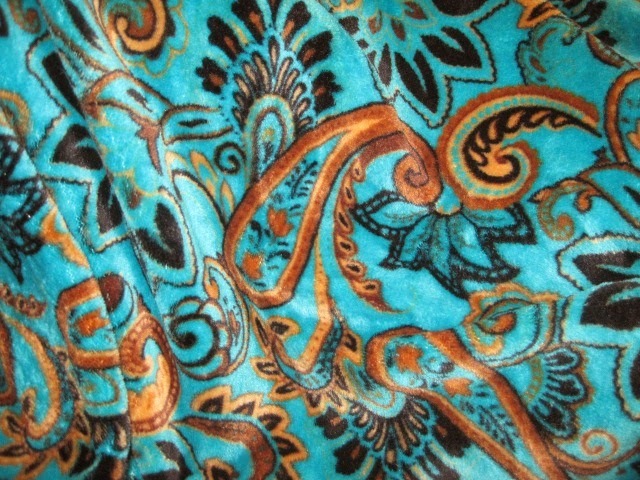 This is the softest blanket ever...and I love the colors. I also printed something new for November for the clipboard on my gallery wall. I love that I can change out my "art" so easily. Well folks, that's it for today. I have been thoroughly enjoying my 3-day weekend. I got some much needed rest yesterday and went shopping with my sister today. I am having a lovely evening as well. My sweet niece Taylor just bought me a yummy bowl of chili for supper. It is cold in Florida tonight...supposed to be in the thirties in the morning and it was inthe fifties all day. It was super windy too..so I froze getting out of my vehicle all day. I am enjoying my toasty new heater tonight though and I'm about to enjoy this delicious chili while I watch a Christmas movie on Hallmark. Don't judge...lol! I love Christmas movies and books and will watch and read several over the next several weeks. Prayers for a blessed and beautiful Sunday. Once again, you amaze me with your thrifting finds - you are incredible, Vicky! Wonderful finds, as always! I'm really wanting that afghan right now on this chilly morning. The portrait of Sadie is awesome...and the wall looks great. 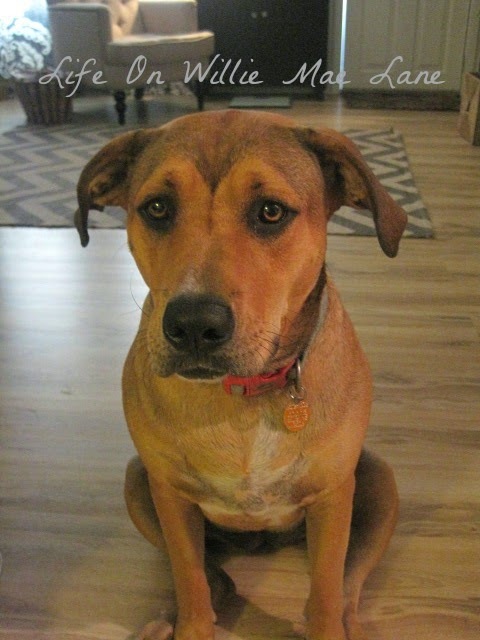 Sadie's portrait is so adorable. Cecilia captured her personality and the colors are perfect for you. Great thrifty finds! If you have time tonight, link to Make It Monday - it starts at 7PM. Forgive for forgetting to alert people to the ornament exchange on my post today - I was too excited about the snow. Oh I love all of your thrifting finds and so cheap! Bonus! That portrait of Sadie is so nice, love the colors. Oh my gosh - Cecilia is just amazing - LOVE your painting of Sadie - ( LOVE my painting of Soda ) She captured her perfectly !!! WOW! You made a haul.....and what great prices! And then to find the portrait waiting for you. Love the colors. Vicky, love the pet portrait! How sweet! I am being much pickier at the thrifts also. Still buys things I just love but also things I need! I love that you are a big bargain hunter like I am!! Looking forward to the ornament exchange. 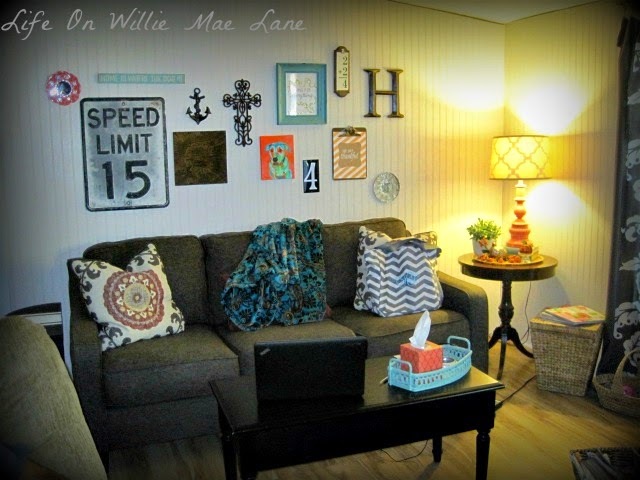 I love that picture of your living-room: it looks so cosy with the blanket and the table lamp. Sadie's portrait ties your touches of colours perfectly. More amazing treasure Vicky. You got a lot of great deals! I love the painting of Sadie. Such a sweet face. 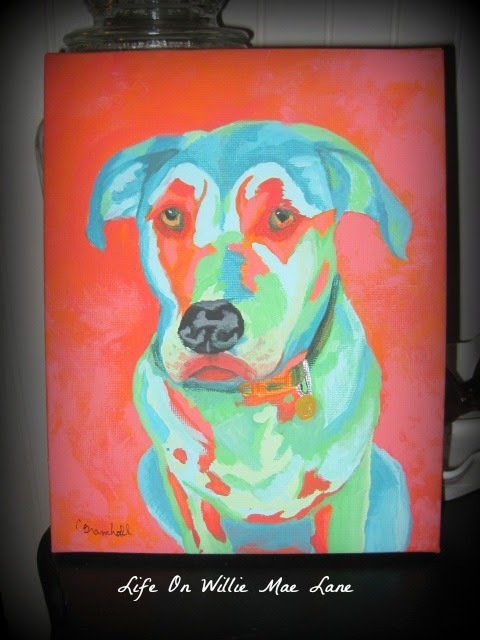 Ceciclia did such an amazing job on Sadie's portrait.The colours are so perfect! I find I'm getting much more choosy when I'm thrifting now too, and it feels good. I love your gallery wall. 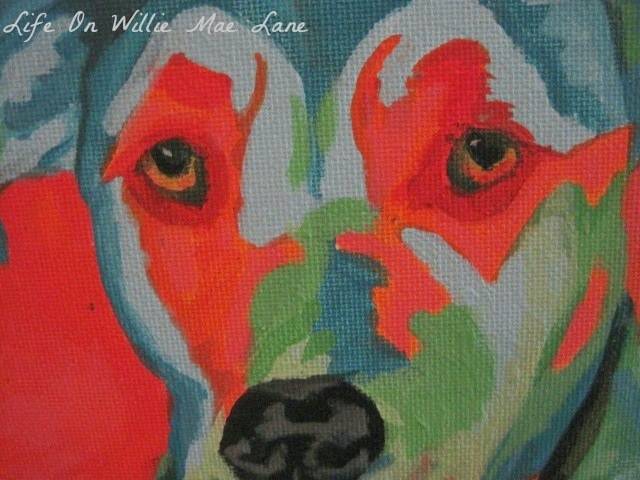 Thank you so much for sharing your finds and the great portrait of Sadie at Make It Monday. I am very happy you came over! Congratulations on your portrait. It is gorgeous! I really need to shop where you shop. How come the thrift stores here are so overpriced?? Hello there! I need to go thrifting with you. You always seem to find some amazing deals. Our thrift stores aren't very nice here. I guess I need to travel to another little town to see what good deals I can find. The portrait of Sadie turned out nice and very colorful! I hope you are doing well, I haven't been very active of the blogging sphere in a while. It's been so busy here. So, I am catching up today... well at least trying too. Vicky, You really brought home some beautiful things from the thrift store! I have found several small ceramic bowls over the summer and purchased them. They come in handy for herbs and spices when I am cooking. Gorgeous finds Vicky, congrats on winning the pet portrait, it's so fun. I'm trying to catch up on all my reading. Love all your finds and they were so cheap! That's just amazing. And I'm thrilled you love Sadie's portrait...it looks amazing on your gallery wall. Florida seems to have amazing thrift stores with even more amazing prices! Lucky lady. Cecilia is so talented, and how fabulous that she painted your adorable fur baby?! It's perfect! I just found your blog after being on Make it Monday. I love your finds. I am going to hang up one of my clipboards and use it to hold "art" for the seasons. I love that idea.